Tonight Catrina and I are at the Xmas Factor rehearsal with a load of other people getting ready for Sunday night. The media team have produced some amazing videos which have taken our whole media production to another level - very impressive. 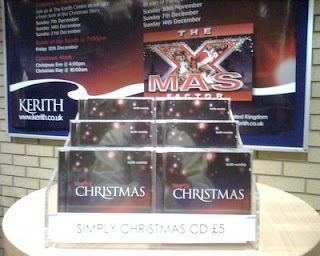 The Christmas CD has also come in. It really is superb, contemporary arrangements of classic Christmas carols with wailing lead guitars (or at least a couple of electric guitar solos!). I might even grow to like carols! Dave Cottee has done an incredible job of pulling it all together. You can buy it priced £5 from this Sunday - makes a great present and all the profits are going to our HIV/AIDS in Serenje. 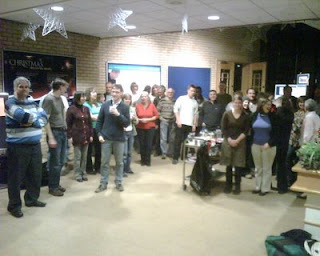 In the middle of a fun evening helping decorate The Kerith Centre and K2 ready for Christmas. 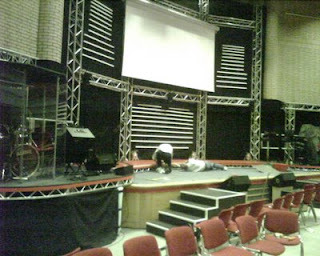 Both buildings are looking great, as is the stage which Steve Hart and his team did such a fantastic job of designing and putting up (just so you know we've used some of last years celebration offering to buy some of the staging so we get to keep it after Christmas which will be a step forward for us). I just can't wait for Sunday night when the building will be full for the first Xmas Factor Live event. Hope to see you there. "We are on our way this morning to Ohrid, Macedonia by minibus. Snow on the mountains here. We will climb 700 metres to Macedonia border, walk through the land border and then by taxi to Millenium Palace Hotel Ohrid for the Newfrontiers Balkans Conference. We are well and travel with 8 others from Elbasan. We return here on Friday afternoon, meal out with landlord and family then onto Tirana on Saturday and then home Sunday. It will be nice to be where there is electricity all the time and things work! Pray for us at the conference as this is a key time for many small churches spread out across Montenegro, Serbia, Bulgaria, Albania, Kosovo and Macedonia. I ask for prophetic words and words to strengthen people. We will see Edi and Artina again and many others we know." Edi and Artina are the couple who came over for the Willow GLS earlier this year - they are a fantastic couple and I think we're going to be seeing quite a bit more of them. Let's be praying for the churches in Albania, and thanking God for us having at least a small part in all He is doing there. 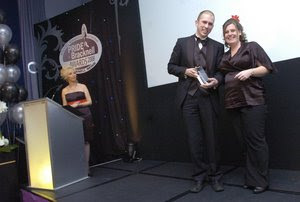 You may remember that Hope08 was nominated for a Pride of Bracknell award. Well I've just hear that we won in the 'special contribution to pride in Bracknell' category. There is going to be a write up about it in the Bracknell News on Thursday, but thought before that comes out you might like this photo of Andy Bagwell picking up the award on behalf of the churches involved. Sandy Lane Primary School also won an "Eco Hero" award - well done to them. As an ongoing Hope08 event on Saturday 13th December we're going to be joining again as churches in Bracknell town centre, singing carols and giving out leaflets inviting people to the various Christmas events at our churches. Minced pies and mulled wine will also be on offer. That runs from 11am til 2pm. Whilst that's going on we'll also be meeting on The Kerith Centre lounge to pray for the outreach. It would be great to have lots of us there both to be part of the crowd and to pray. Please be thinking about who to invite to our first Xmas Factor Live event on Sunday night. It's worth coming just to see how bad I am in my audition video! Be sure to get there on time, as the opening sequence is going to be spectacular, and remember to park in Avis! I'm on a bit of a run of NewFrontiers leaders events. Last week I was at what was called a Wider Leaders gathering. I'm not sure I like being described as a wider leader. Perhaps they're just trying to wake me up to the realities of middle age! 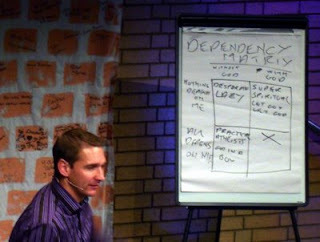 It was up in Warwick and was for leaders who oversee other churches and leaders of the larger NewFrontiers churches. Then right now Catrina and I are battling our way up the motorway to Milton Keynes for a weekend with the couples leading the 220 NewFrontiers churches in the UK. Finally in a couple of weeks I'm off for two days of coaching looking at building larger churches. It's very inspiring spending time with all these leaders, many of whom are facing some of the same issues we are. However, there's a large part of me which would rather be at home this weekend with the children and listening to BenD on Sunday morning! However, I'm sure we'll have a great weekend - hope you do too. I wanted to let you know that Bert's funeral is going to be on Friday 5th December. We'll be having a service at The Kerith Centre starting at 12.45 to remember Bert's life, then going on to Easthampstead Park Crematorium, then back to The Kerith Centre for food and drinks. Given the large number of people who I know will want to come and say goodbye to Bert and celebrate his life, the parking at The Kerith Centre is inevitably going to be stretched so please look to share cars wherever possible. I've been overwhelmed by the number of people who have been stopping me, or sending me emails, to tell me their own particular "Bert story". So many different little acts of kindness which Bert (and his wife Olive) did for so many different people over the years. If you have a "Bert story" then I'd love it if you could add it as a comment to my previous blog entry. There are already a number of stories there, but it would be great to have a whole load of them as a tribute to his life. We might even get to read some of them out on the 5th. Many of you will have heard by now that Bert Leonard sadly passed away at 7.25am on Sunday 16th November. He had been ill with cancer for some months and spent his final few days in the Sue Ryder home in Nettlebed, where he apparently really perked up and loved the surroundings he was in. Whilst feeling sad over Bert no longer being with us, it's impossible to think about him for long without smiling at the memories of the fun and mischief he brought into every situation. I think someone got it spot on when they said on Sunday morning he was the Arthur Askey of our church. Somebody else who knew Bert well wrote to me in an email this morning "He certainly was a great bloke. I don't believe that I ever heard him speak a negative word about anyone. He was always such a positive guy, always up, and we can learn a lot from his life". Bert will remain an inspiration to many of us, especially in the challenge to finish well in our Christian life - it was only earlier this year, at the age of 88, that Bert stopped greeting people at the door on Sunday mornings - what an example. Let's be praying for Bert's family, and for those in our community who I know will be feeling the sadness of him no longer being with us. And let's be thanking God for a life well lived. We'll let you know as soon as we have details of the funeral, which I know many of you will be very keen to attend. Because of problems with relatives getting visas to come over from Zimbabwe the Memorial Service for Jill Steyl has been put back to Saturday 22nd at 2pm. Let's be praying that the visas get sorted quickly so that all the relatives who so want to be there can make it for the 22nd. Hope you have a great weekend and that I'll get to catch many of you on Sunday. A reminder that we've got prayer meetings this Wednesday and Thursday. We've got loads to thank God for, and a bunch of stuff to ask him for, so please make it if you can. 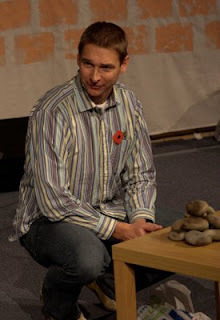 Ben Davies is going to be leading Wednesday night as I'm at a Newfrontiers leaders event in Warwick on Wednesday and Thursday. Ben then flies off Thursday morning with Ben Oliver to Poland for some time with Darek and the rest of the church there. I'm then hoping to be back in time to lead Thursday night. Hope you manage to make one evening or the other. For those of you who knew Jill the memorial service to celebrate her life will be on Saturday 15th November at 2pm at the Whiteley Village Sanctuary in Walton on Thames. Lydia (my wonderful PA) contacted the Sanctuary today and was given the following directions, which I hope will be helpful. The Sanctuary is the Free Church in Whiteley Village, and sits at the opposite side of "The Octagon" from St Marks, the C of E Church. At weekends there is only one point of access into Whiteley Village, this being through our North Gate. The post code for this gate is KT12 4EN. On entering the gate, follow North Ave as far as you can go (over junctions & memorials, past building sites). When you can go no further, the Sanctuary is just to your left. If you are planning to attend please could you contact The Kerith Centre reception by Friday as we have promised to let Jill's family know how many people are coming so that they can cater accordingly. 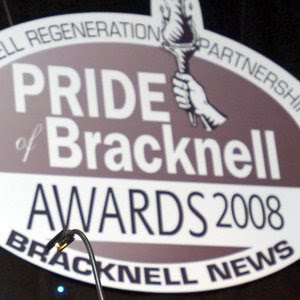 Thought you might like to know that Hope Bracknell, our summer week of social action projects followed by our big Hope in the Park party on the Saturday, has been nominated for a Pride of Bracknell award. This is a competition run every year by the Bracknell News to celebrate some of the great things going on in the area. It's a real recognition of the quality and impact of what we did over the summer that we've been put forward for this. I did a video interview for the Bracknell News last Friday, which is going to be shown at the awards ceremony on Friday 21st November. I'm not going to be there on the Friday as Catrina and I are going to be away that weekend at a NewFrontiers elders and wives event, but I'll let you know as soon as I hear any results. In the words of Kool and the Gang - Celebrate good times,come on! Lots to celebrate from the weekend just gone. Secondly to celebrate the 11 people we baptised on Sunday. For me there's nothing more exciting than hearing stories of changed lives. It always brings me back to realising that this is why we do what we do. That we get the privilege to partner with God in seeing the lives of ordinary people like you and me transformed by an encounter with an extraordinary God. Just fantastic. We have so much to be thankful for, and to celebrate. As I said on Sunday morning let's never forget what God has done for us, but like the 12 stones they took out of the Jordan as they crossed into the promised land and built into a memorial, every time we see what God is doing in the lives of others be reminded of all that he has done for us through his death and resurrection. Many of you will remember Jill Steyl, a lady from Zimbabwe, who was part of our community for a number of years. I will always remember Jill for the encouraging things she used to shout out from her seat up in the balcony whilst I was preaching, as well as the lively feedback she'd give me on my sermon at the end of the meeting. She was certainly a character, as well as a passionate follower of Jesus! Well sadly Jill died of cancer on the 24th October. I spoke today to her daughter Lorraine, who managed to get over from Zimbabwe to be with Jill for her last few days, and had a good chat with her as we shared some 'Jill' stories. There is going to be a memorial service for Jill in Walton on Thames and then a funeral in Wales. Details have yet to be finalised, so please contact our receptionists if you want to be told when either of these events are taking place. Let's be praying for Jill's family as they come to terms with their loss. Just to let you know the five of us who went up to HTB yesterday to hear Bill Hybels speak had a magnificent time with him. I wish you could all have been there as everyone would so benefit from hearing him pour out his wisdom gained in 33 years of leading Willow. However, lots of what we learn on days like that will hopefully come out in what gets preached and the directions we take as a church over the next year, so hopefully you will benefit from it at least indirectly. In the middle of the day Bill actually left us for about 3 hours to go and record an interview with Bono, who happened to be in London, for next years Leadership Summit. How cool must that be! Sadly none of us were asked to accompany him, although after Bill's wife Lynne spoke here at the launch of our HIV/AIDS project in October she did contact me to let me know she'd emailed Bono to tell him about what we were doing, and how it had been inspired by the talk he did at the Leadership Summit 2 years ago. Not quite as cool as getting to meet Bono, but still pretty good. Talking of the project in Serenje I got the latest gift day total today. I'm going to announce it on Sunday, but suffice to say for now that it's very, very exciting. Don't forget we've also got baptisms Sunday morning and evening which are also going to be unmissable. Just to let you know that my beautiful wife, Catrina, has now set up her own blog. The primary audience is the Kerith women and helping them connect better with one another, with God and with His plans for their lives. Or it may just be a chance for you all to find out even more about the inner workings of the Benham family!